You know the days where you feel like you have so many clothes but nothing to wear? That happens to me a lot, and on those days I gravitate towards my favorite classic pieces. Not surprisingly, these tend to be neutrals. I’ve had this faux leather jacket since my Nordstrom x Topshop event in October and wear it at least once a week – it’s a wonderful basic that’s great to throw on over a tee + jeans combo or a more dressy ensemble like this outfit. I kind of can’t believe the jacket still available, mostly because it’s only $85! This silk Theory top is a recent acquisition but I’ve worn it multiple times already – it’s a simple silk piece, but the layered look makes it a touch more elegant. It’s easy and looks chic with any bottoms. The skirt was a Nordstrom sale find and is now sold out unfortunately, but this Alexander Wang look-a-like is a close second. This trio of colors is abundant in my closet and I am constantly jumping back to them when I’m bored of prints and loud details. What are your go-to items on days like this? PS – I’m driving down I-35 this morning heading back to Austin for Easter weekend – how you are spending it? Hope you have a happy weekend and eat lots of Reese’s peanut butter eggs! This is my favorite outfit you’ve posted! Chic yet edgy, I love it! So sophisticated & chic – the mix of textures here is gorgeous! Great look, Merritt! Love this color combination… Silky blouses are my favorite! I wear them far too often. Featuring a great bright red Joie one over on my blog today :) Hope you have a lovely weekend! I love the balance here of modern and classic. 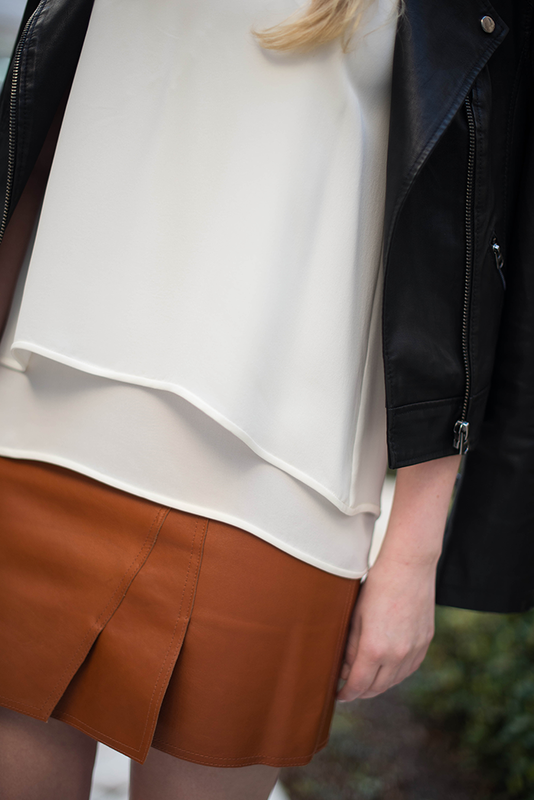 The leather skirt and jacket give the look some edge but the layered top is soft and feminine. I’m a neutral girl myself so this ensemble definitely speaks to me! This skirt is perfect! Love, love, love! Those earrings are adorable! I also feel like I’m constantly thinking that I have nothing to wear even though I have a closet full of clothes! Love the combination of neutrals and the details of the skirt! Have a Happy Easter! Great outfit! I love those shoes!! Have a great weekend! Merritt you look stunning! I love this outfit – gorgeous and chic! That skirt is amazing! love all the lines in this outfit! 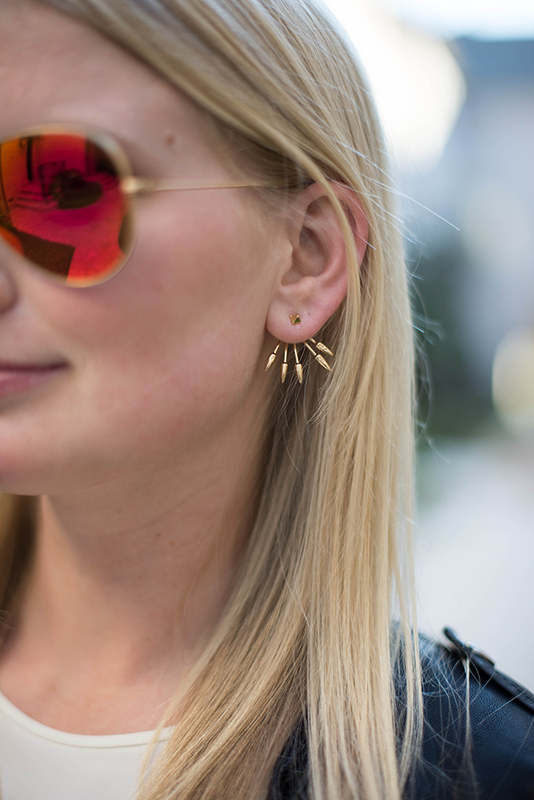 This earrings are awesome! Have a great weekend! I love your use of leather, happy weekend! My favorite shoes! I loved how you styled them. You look beautiful! Oooh lala! I love this mix of neutrals! I still can’t get over how adorable those shoes are! love it all! What a great outfit! Love the mix of these pieces! Classics at their best. Love love love how you styled this whole outfit! Everything looks great and all the pieces work so well together! My favorite piece has to be the tan skirt.. or the shoes… also the jacket! Basically everything! You look beautiful, as always. That Theory top looks like the perfect shell – interesting yet versatile. I love this whole look! That skirt is amazing and those earrings are fabulous! I must have those shoes! Oh I love your shoes!!! So great!! !